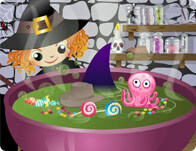 This cute witch is preparing a potion for her best friend. Help her to brew it and to choose the ingredients for it. Make sure everything is done right and enjoy it!